As normal on a Friday, it’s a bit of slow day at work 😐 but it does give me the chance to mess about in the lab! We were talking about the VPLS instances that we have going at in the office and I had never configured it up for myself, so I thought this would be the perfect time to set something up and give it a punt! This post is just about how to configure a VPLS instance. I will write another post going into the inner working of VPLS, however right now I know and understand how it VPLS works but couldn’t explain it! Firstly, I will configure the interface that is connected the Customer Edge (CE) device, so that the router knows this is apart of the VPLS. We will need to set the encapsulation to VPLS and set the logical interface. Out of the 3 ways of configuring a VPLS instance using LDP, configuration wise, is the most straightforward. Under the protocols stanza, we will need to make sure all the related protocols are enabled, in addition we will need to make sure the MPLS LSPs correctly configured. It is important to know that, you will only need to set LDP on the loopback address not on any other interfaces that has MPLS configured. This is because the LDP peering with only the other PE and not the interlinks between the routers, this is also why you need to have an IGP configured to get connectivity to the loopback. Time to move onto the BGP version of configuration a VPLS. We will keep the same configuration above keep on the all the PEs. Using BGP configuration for VPLS is extremely useful as if more scalable and if you already have BGP running on your network, you don’t need to create any new BGP sessions for the VPLS session! As similar with L3VPNs, under the VPLS routing-instance, we will need to add Route-Target and Route-Distinguisher. This is because unlike with we used LDP, we don’t have defined neighbor under the VPLS stanza. Additionally under the VPLS protocol site-identifiers have to be added. We are also able to configure a VPLS instance with LDP and BGP. We will use the same configure as above, as we will only need a few changes. 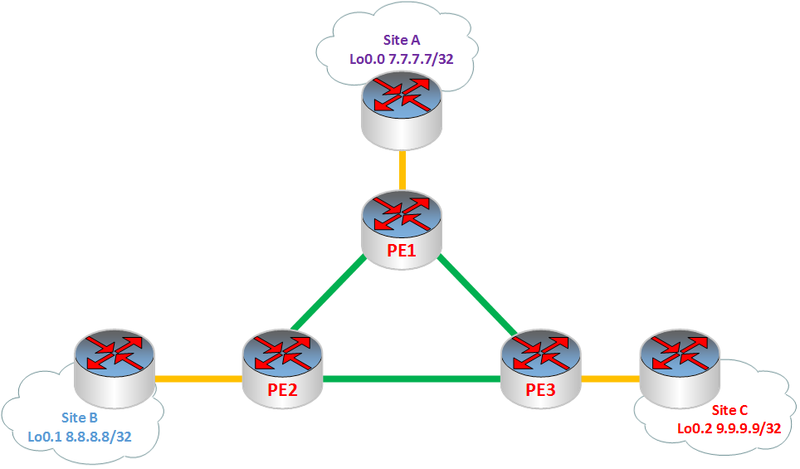 We will need to change the family l2vpn stanza in the BGP session from signaling to auto-discovery-only, add l2vpn-id and remove the entire configuration under the protocol vpls (except no-tunnel-services) stanza in VPLS routing instance.